Home Australia Have You Heard of the Legendary Flaggerdoot? Have You Heard of the Legendary Flaggerdoot? The Mornington Peninsula is beloved by many as a place of fairy-tale like whimsy and beauty, but tumble down the rabbit hole to explore the wonders of the Willow Creek Vineyard site and you really will enter a new world. It’s here you’ll find Flaggerdoot, the Peninsula’s premier cocktail bar. A craft cocktail bar in the middle of a wine region? Yes, you read that right. To be honest we had the same reaction, but this weird and wonderful concept seems to be working, with the bar celebrating its first birthday this month. 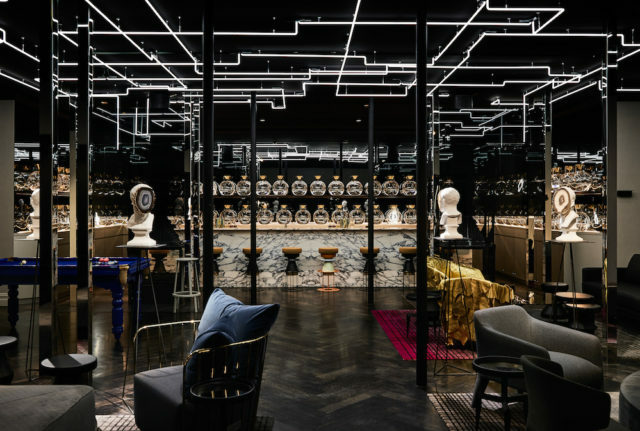 Flaggerdoot is the hotel bar of Jackalope, artist Louis Li’s avant-garde, luxury hotel and dining concept that encompasses the 11-hectare property. To understand Flaggerdoot, you first need to understand Jackalope. The hotel is named after the mythical Jackalope, a jackrabbit with the horns of an antelope. A flaggerdoot is a collective group of jackalopes. Wander down the long, meandering driveway and you’ll come across McCormick House, the grand Edwardian era homestead that houses this quirky creature of a bar. The focus here is on bespoke and classic cocktails, particularly gin and whisky based mixes. This offering will soon include a number of cocktails presented in clay pots, believed to add an element of creaminess to the flavour whilst maintaining the integrity of the cocktail. The interiors evoke these creations, styled like a mad alchemists workshop with rows of empty unmarked bottles and busts with their faces torn off. Strange, futuristic elements like the neon-lit bar and electric blue pool table sit in stark contrast to the 140-year-old building, however classic touches like the herringbone floors and the open fireplaces are subtle reminders that the realm of the Flaggerdoot is actually our own. Previous articleAustralia’s Best Sparkling Wines for 2018 Revealed! Next articleFinal Days to Enter Sydney Cider Cocktail Competition 2018!